Want to know about Param Vir Chakra gallantry award? PVC is the highest gallantry award of India. 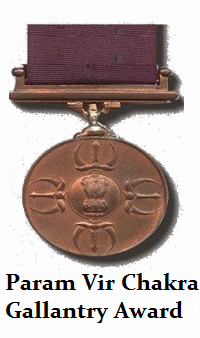 Check out design, recipients and occasions of awarding Param Vir Chakra. Param Vir Chakra is an Indian military award given to the armed forces personnel who show most conspicuous bravery or some daring or pre-eminent act of valour or self sacrifice, in the presence of the enemy, whether on land, at sea, or in the air. PVC is the highest gallantry award of India and second highest award of India. The PVC gallantry award came in to effect from 15 August 1947. All Indian military personnel are eligible to receive the PVC. This highest gallantry award of India is given to those men who shows extra ordinary courage in the war time or in the presence of enemy. The PVC award was Indian gallantry award equivalent to British country's Victoria Cross. Forming of the Param Vir Chakra award was ordered by Pandit Jawaharlal Nehru after India got its independence. The PVC was designed by Savitri Khanolkar wife of an Army officer - Vikram Khanolkar. The PVC is a circular disk made from Bronze with a diameter of 1.375 inches. The PVC was holded by a purple ribbon of 32 millimetres length. There are total 21 recipients of Param Vir Chakra award. Only one personnel of Indian Air Force has been awarded with the PVC and rest all 20 personnel are from Indian Army. No one from Indian Navy has received the award till now. Here are Service Number Rank Name Regiment Date Place Notes details of all recipients of the PVC.